Former standout at Nathan Hale High in Seattle has been bothered by back and hip problems. The forward was once projected as a No. 1 overall draft pick. 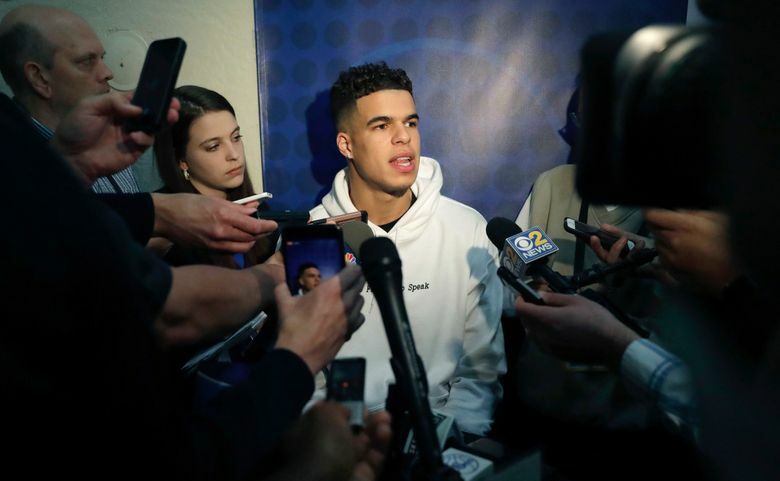 Someone is going to gamble on Michael Porter Jr. He insists it will pay off. There is an element of danger involved with every NBA draft pick, in that nothing is guaranteed. But there isn’t a player who epitomizes the risk-versus-reward thinking in this draft more than Porter, who could get taken as high as No. 2 by Sacramento or go several picks lower because of uncertainty surrounding his health. Back problems that necessitated surgery limited his lone college season to three games at Missouri, and a scheduled Friday workout was called off because of hip spasms. There is still a chance he will do a workout before draft night and teams have received access to new medical information that would seem to suggest he is ready for the NBA — but still, skepticism may be understandable. “I’m feeling great,” said Porter. Find out Thursday night during the draft which team believes him the most. Porter led Seattle’s Nathan Hale High School to the Class 3A state championship in March 2017 and was viewed as a potential No. 1 overall draft pick by many observers. He is 6 feet 10 and is usually categorized as a power forward, though in an NBA that is now largely positionless Porter could wear a lot of hats. He has already shown a complete skill set — passing, dribbling, shooting — that would translate to playing basically anywhere except center. Porter weighed 211 pounds last month at the draft combine, meaning there’s still plenty of room on his frame to add strength. His college highlights are basically nonexistent: Porter scored 30 points in 53 minutes of action with the Tigers. Porter’s reputation is largely built on what he did during his prep career, and there was a workout earlier this month arranged by agent Mark Bartelstein where he got rave reviews. Alive, well and moving would seem to be the absolute basic prerequisites for a team to be satisfied about when preparing to use a lottery pick on someone, but Porter vows whichever team grabs him won’t be disappointed. Porter played two minutes in his college debut in November, then underwent back surgery — a microdiscectomy of the L3 and L4 spinal discs — about a week and a half later. He returned for an SEC tournament game against Georgia, then put up 16 points and 10 rebounds in Missouri’s loss to Florida State in the NCAA tournament. That’s what Porter wants NBA teams to remember before making their selection. He believes he is the best player. But with every indication big man Deandre Ayton will go No. 1 to Phoenix, the intrigue starts at No. 2 and Porter is surely getting a long look from the franchises that have the other top-10 spots, those being, in order, Sacramento, Atlanta, Memphis, Dallas, Orlando, Chicago, Cleveland, New York and Philadelphia.